Christina's Christmas Cookies — Ends in Style. Who doesn't love making cookies during the holidays? It is the perfect time of year to get creative with your baking and try some new, beautiful recipes. Our german, baking queen Christina not only whipped up these delicious cookies, but shot and styled them as well! 3/4 cup of your favorite jelly. Preheat the oven to 350 degrees F. Line two baking sheets with parchment paper and spray with nonstick cooking spray. Pulse the peanuts in a food processor until they are a fine meal. Add the oats, flour and salt and process until blended. Transfer to a bowl. In the food processor, combine the butter and sugar and process until light and fluffy. With the motor running, add the egg and vanilla. Process until smooth. Add half of the dry ingredients back into the processor and pulse to combine. Add the remaining half and pulse again until combined. Drop the cookie dough by the tablespoonful (I use an ice cream scoop) onto the prepared baking sheets, leaving about 1 1/2 inches between the cookies. Use your thumb to make a thumb print in each cookie. Bake until the bottoms of the cookies are lightly golden brown, 12 to 15 minutes. Cool on a wire rack. Stir the jelly in a small bowl to loosen it up and fill each thumbprint with about 1 teaspoon. Preheat oven to 325 Degrees F. Combine the coconut, condensed milk, and vanilla in a large bowl. Whip the egg whites with electric mixer until firm. Carefully fold the egg whites into the coconut mixture. Drop the batter onto sheet pans lined with parchment paper, using either an ice cream scoop or teaspoon. Bake for 25-30 min, until golden brown. Cool and serve. For the cookies: Sift together the flour, baking powder and salt. In a large mixing bowl, with an electric mixer, cream the butter and sugar until light and flufy, about 2 minutes. Add the egg and mix until combined. Gradually add the sifted dry ingredients, one spoonful at a time, until thoroughly combined. Add the vanilla and (green food color optional). Chill the cookie dough in the refrigerator for at least 1 hour. Preheat the oven to 400 degrees F.
Roll out half of the dough at a time, keeping the remainder of the dough in the refrigerator. 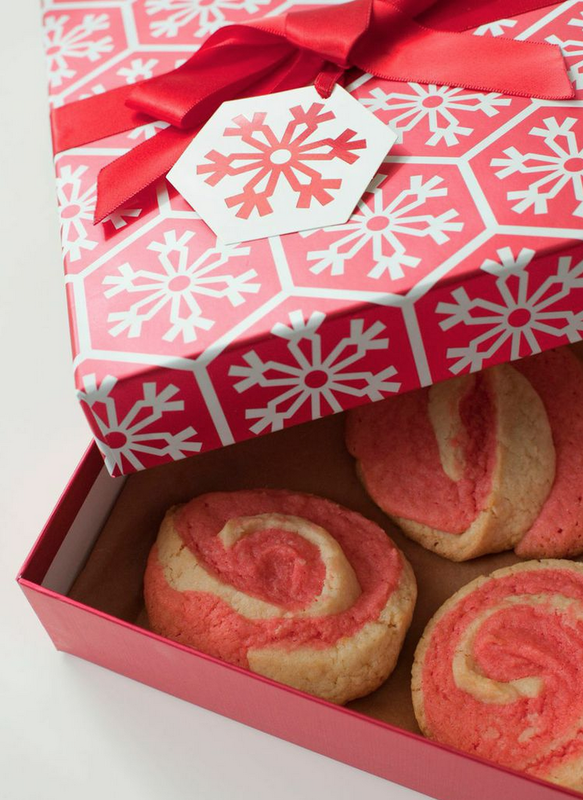 On a lightly floured surface, roll out the dough to a 1/4-inch thickness and cut into desired shapes with a cookie cutter (for medium cookies, use a 3-inch cookie cutter). Place the cutout cookies 2 inches apart on an ungreased cookie sheet and put the cookie sheet in the refrigerator for a few minutes before baking. This will help the cookies to retain their shape (you can roll out the scraps to make a few more cookies) Bake until just before the edges of the cookies start to brown, 8 to 10 minutes (if baking two sheets at a time, rotate halfway through baking). Cool the cookies for 1 to 2 minutes on the cookie sheet before removing to wire racks to cool completely. Mix the 2 sugars and the salt together in a medium bowl. In another small bowl, whisk the egg and set aside. With a hand held mixer beat the butter until smooth in a large bowl. While mixing, gradually add the sugar mixture and white chocolate, and continue beating until lightly colored and fluffy, about 1 to 2 minutes. Stop mixing and scrape down the sides of the bowl. Add the egg mixture and beat until smooth. Gradually add the flour, mixing slowly until blended. Turn the dough out of the bowl, divide in half. Place the halves between 2 pieces of lightly floured parchment or waxed paper. Roll into a 10 by 12 by 1/4 inch rectangle. Slide the sheets of dough/parchment sheets onto a baking sheet, and refrigerate until firm, about 2 hours or overnight. With a hand held mixer beat the butter and Marzipan until smooth in a large bowl and add the sugar and the salt until lightly colored and fluffy, about 1 to 2 minutes. Stop mixing and scrape down the sides of the bowl. Gradually add the flour, mixing slowly until blended and red food coloring. Turn the dough out of the bowl, divide in half. Put 1 of the white chocolate doughs on the workspace and remove the top sheet of parchment. Brush dough lightly with cold water. Place a sheet of white chocolate dough on the workspace, and remove top sheet of paper. Using the bottom piece of the paper to lift the dough, place the white chocolate dough on top of the red marzipan dough. Take care to line up the edges of the 2 doughs and trim as needed. Lightly press to smooth and seal the doughs together. Remove the top piece of paper. Brush the surface of the dough lightly with cold water. Position the sandwiched doughs with the long edge facing you. Using the edge of the paper as a guide, roll the doughs into a tight cylinder, 2 inches wide. Wrap in plastic and refrigerate for 1 hour. Repeat with remaining 2 sheets of dough. Evenly position racks in the oven, and preheat to 325 degrees F. Slice the dough crosswise into 1/4-inch thick cookies. Lay about 1/2- inch apart on parchment-lined baking sheets. Bake until just golden - not too dark you'll lose the definition of the spiral, about 14 to 16 minutes. Good luck with all of your baking this Holiday season!